Peanut butter and sesame noodles combine with bean sprouts in this hefty salad, served cold. 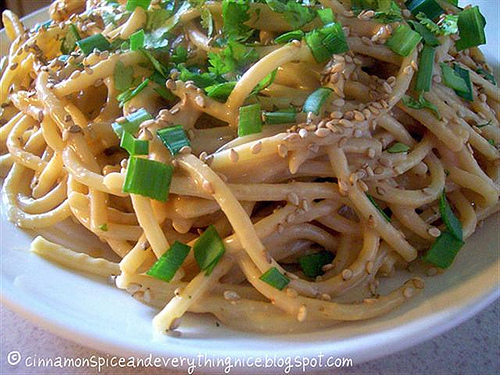 * Peanut butter and sesame noodles combine with bean sprouts in this hefty salad, served cold. Even though there’s 3 inches of snow on the ground as I write this, it’s still important to do whatever we can to cook with fresh and healthy ingredients. Today I’m making a salad. Not a traditional one, but rather a cold, main-dish pasta salad that’s loaded with nutrition and flavor. It’s a salad that has been drawing raves for more than 30 years. I call the dish “Vicki’s Noodles,” named for a long-time friend from another time in my life (and she’s still a friend–thanks to Facebook. HI, VICKI!). The dish is a peanut butter and sesame noodle salad, a bit like Pad Thai, but easier to make, and served at room temperature. The essentials of the dish are noodles, sauce and fresh bean sprouts. I’m enamored of fresh bean sprouts, which we make ourselves right in the kitchen. They’re tasty and nutritious; and easy and fun to grow — watch them grow right on your kitchen counter (a great winter project for the kids). Also, when you grow your own, you ensure their freshness; you get them at the peak of crispness and flavor. Just eat up what you make within a day or two. Simply put, sprouts can be made in two to five days from beans, soaked overnight, and rinsed and drained twice a day. For complete instructions, see my blog (www.chefzillaskitchen.typepad.com); browse at www.sproutpeople.org; or type “making bean sprouts” into your favorite search engine. I usually make the dish as outlined below, but I have also included chopped snow peas or sugar snap peas, which we grow in our garden. We’ve also added slices of grilled chicken or flank steak; or with cubes of premium dry tofu, lightly grilled. Play with it and see what you like. There’s almost no ingredient you could add that wouldn’t make it better. The sauce is sweet and tangy, but it doesn’t get in the way of additional ingredients. You also can give it a note of Thai by adding some fresh chopped basil and a bit of fish sauce. This recipe has just a hint of heat, but if you like your food spicy (as I do), simply increase the amount of hot chili oil, or add a teaspoon of dried red pepper flakes to the sauce. As for the noodles, I’ve most recently been using protein-enhanced linguine. But you can also make it with whole wheat or Asian buckwheat noodles, rice noodles, spaghetti or whatever pasta you prefer. They make it creamy and crunchy. And Oh, what a product. Read the label. Ingredients: peanuts. PERIOD! No nothing else. And the creamy? Man, oh man, is it creamy! Sure it’s got some oil at the top, and I hear from folks all the time that they won’t buy peanut butter with oil at the top. Huh? Peanuts have oil. Get over it. Just don’t buy a product that adds other oily stuff. Like palm oil. Or coconut oil. Or any oil. Don’t like the oil? Turn the jar upside down in you cupboard for a few days. It mostly goes away. Back into the peanuts. Or, mix it well once and put it in the fridge. I guarantee you it will spread easier than any other peanut butter kept in the fridge. Don’t want to keep it in the fridge? That’s okay too. It will just separate again. No prob. Mix it again, or turn it upside down every few days. Think about this…the peanut butter you now use won’t separate. Why do you think that is? The manufacturer puts nasty stuff in it to keep the oil in suspension. Artificial stuff. Want that in your body? I don’t. Crazy Richards. Peanut Butter. Available in smooth and crunchy at Giant now. If you live in the midwest, look for a brand called Krema. Same stuff, same company. Just a different brand name and label for that region of the country. And, if it’s not available where you live, check out their web site, http://www.kremaproducts.com/Crazy-Richards-Peanut-Butter/products/1/. Now go make some peanut noodles, and thank Vicki for her fabulous recipe. Prepare the noodles al dente, according to the package. Rinse under hot, then cool running water until they reach room temperature. Toss the noodles with 2 tablespoons sesame oil and set aside. A half-hour before serving, combine noodles with the peanuts (reserve about 2 tablespoons), bean sprouts, cabbage, carrot and half the scallions. Add the peanut sauce and toss to coat all the ingredients with sauce. Allow to rest for a half hour, sprinkle the rest of the peanuts and scallions over the noodles, then serve. If you plan to add chicken, steak or tofu, they can be grilled ahead of time and chilled. The noodles and the sauce can also be made ahead of time and refrigerated. If you do, allow the ingredients to return to room temperature and whisk the sauce well before combining. Jeff Thal’s column appears every other Sunday. E-mail him at talking.fresh@yahoo.com or visit his blog at talkingfresh.typepad.com. Posted on August 6, 2012, in Uncategorized. Bookmark the permalink. 1 Comment.